Should you be missing all of your teeth in the upper or lower jaw, dental implants are the best solution. You can choose a full bridge that is attached to several dental implants or another option is a removable prosthesis that is attached via anchoring devices to two or more dental implants. 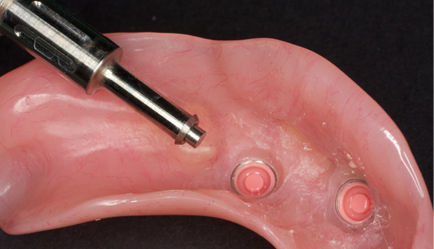 This prosthesis remains securely in place in your mouth, however it is easy to remove. 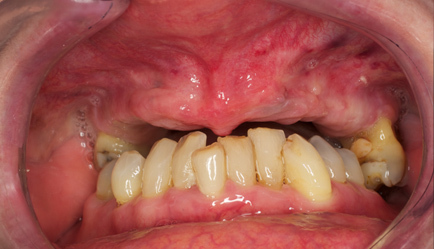 This patient had a loose unattractive full upper denture. 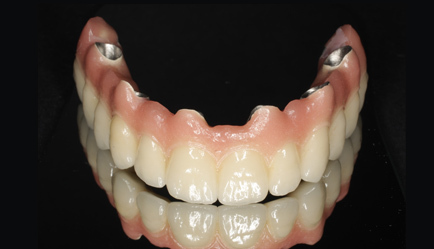 Providing a beautifully crafted cosmetic dentures supported on four implant routes completely solved the looseness allowing the patient to eat with confidence. Recreating the lip support produced a beautiful smile. 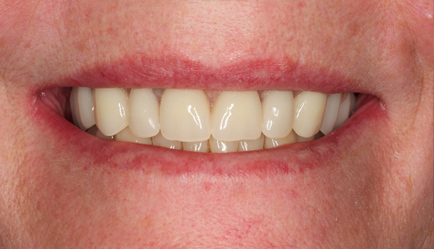 Having no natural upper teeth this patient wanted a fixe solution, not a denture. computer guided surgery was used to place six implant roots. 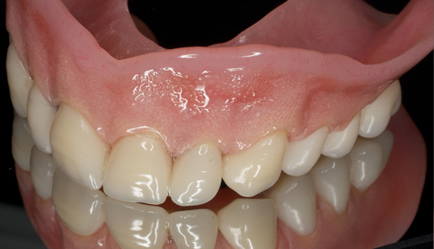 The exceptional skill of world class ceramist recreated the missing teeth and gums in porcelain (the final bridge is shown out of the mouth before fitting). Should you have lost all your teeth in one or both jaws, we install a permanently anchored dental implant bridge or a removable prosthesis that is connected to two or more dental implants, this is called an overdenture. 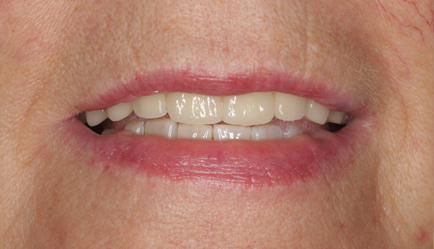 This type of overdenture dental implant solution remains in place more firmly than a conventional removable prosthesis. This is the most natural looking solution, and provides a more comfortable, less hassle and more secure natural looking teeth replacement solution. To achieve a permanently anchored dental implant bridge, several dental implants are installed to form a stable foundation. Because the dental implants are anchored in the jawbone, they stimulate the bone tissue and help to maintain healthy bone levels and facial structures. 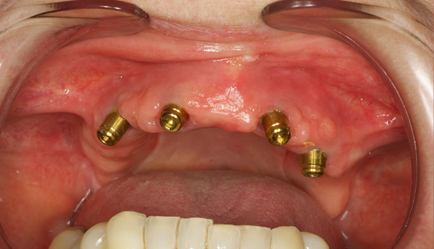 The abutments are attached to the dental implants and the bridge is fitted in place. We then spend time ensuring that you are happy with the new smile we created and that it looks natural. 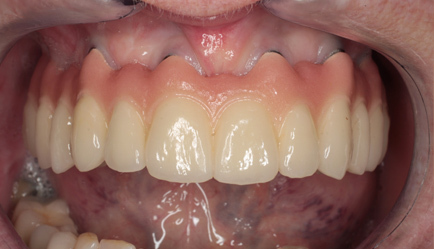 The dental implant bridge, or the overdenture, is now in place, it looks and functions like normal teeth. Once the dental implant has been installed you can confidently eat whatever you like and laugh without having to worry about the prosthesis falling out.